Like every Brazilian, I always heard about Rio as "The Wonderful City". After this trip I couldn't agree more with that reference. The beaches, the Guanabara Bay, the views, the people, and the good energy of Rio can not be compared to any other place I have ever been. We stayed at the Arena Ipanema Hotel, which aside from having a wonderful breakfast, was very well located. On our first day in Rio we took the cable car ride that goes to the Santa Teresa neighborhood. When we got there we went to Parque das Ruinas, which is a park with an art gallery built around the ruins of a mansion. Then we walked to the Selarón steps, where Snoop Dog and U2 shot music videos. 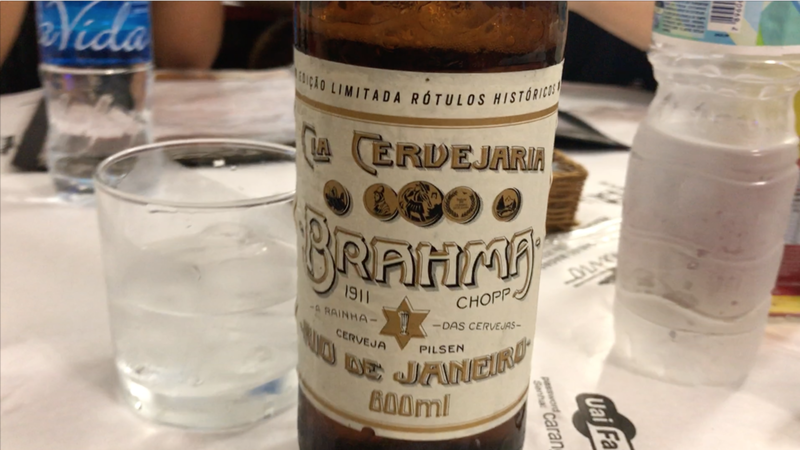 And then it started to get dark so we took an uber to Bar do Mineiro in the Lapa neighborhood. There we tried the pastel the feijoada. Pastel is a typical Brazilian savory pastry and feijoada is a bean dish. Pastel is a common snack but usually filled with cheese or chicken flavor, not feijoada. So we had to go there and try it. It was delicious! Lapa is a great area to visit in the evening. There are plenty of bars, restaurants, live music, and people wanting to have a good time. On the second day we decided to rent bikes and ride them around the Rodrigo de Freitas Lagoon. At first we tried to rent RioBike (Rio's version of citibike), but all the kiosks were empty so we ended up renting from the people who are right next to the lagoon. The rental price was 15 reais for an hour. After the bike ride we got a little hungry and went for lunch in Lage Park. Such a beautiful place! The third day was amazing! We woke up super early and went on a hike at Morro dos Dois Irmãos. To get on the trail, we took a mototaxi (a taxi which is a motorcycle) at the entrance of the Vidigal Favela. We went with a tour guide who grew up and lives in the favela, so we felt safe at all times. The hike was far more difficult than we had expected. As always, I did a research on all the tours, and everything I read said that it was an easy hike, but in reality it was not easy to get to the top. However, it was so so so worth it. The view from up there was my favorite view from this trip. Besides that we also burned a lot of calories and now we had an excuse to eat a lot of cheese bread and drink caipirinhas haha. On the way back we asked our tour guide if we could take another mototaxi instead of walking because Lindsey loved the "adventure" of it. After the hike we went to the hotel to take a shower and eat because we needed it so badly. We still had time to take a 40-minute nap before our next tour: Floresta da Tijuca. We visited the forest with Gui a tour guide from the agency Rio4fun. He knows every part of the forest and took us to the most beautiful spots. We brought our drone with us and we did some nice shots of the forest (you can see everything in the video at the end of this post). Then he took us to Tacacá do Norte, which is a store/restaurant with food from the northeast of the country. There we tried açai with tapioca, crab cake, cupuaçu ice cream and the famous tacacá. On the fourth day we went to Arraial do Cabo. What a gorgeous place! Although the water at some beaches was quite cold, it was also super crystalline, just like the Caribbean beaches. I felt like I was in paradise. On the fifth day we finally went to Christ the Redeemer. Thanks to my research, I found out that the best way to visit the Christ is in the morning, if possible right when they open. And that's what we did, we took the 8am cable car to the top of Corcovado and we got there when everything was quiet. After about 15 minutes the place was filled with people. And yes, it's very beautiful up there because it has a stunning view of the Guanabara Bay, and it's exciting to be at one of the seven wonders of the world. Another outstanding part of our trip was watching the sunset on Ipanema Beach. The sky was splendid, and I felt so peaceful and calm. Also, when the sun disappears behind the Morro dos dois irmãos everyone started to applause. I won't forget that moment. On our last day in Rio we enjoyed the morning at the hotel's pool. Part of me was super happy for having done so much cool stuff while in Rio, and another part was sad because I knew the trip was almost over and very soon I would have to return to the NY winter. There are places that we visit and we like them very much, but we do not think about returning again. This is certainly not the case for Rio de Janeiro. Every day I think about how "wonderful" this city is and I cannot wait to go back there.